I’ve been thinking about my childhood as a “Missionary Kid” quite a bit today, mostly because I’ve been in the kitchen preparing my contributions for a Caribbean-themed potluck later this weekend, but also because I’m still reflecting on two movies I had on this morning about the missionaries to Ecuador who were killed in 1956. I would highly recommend that you do the same, as the stories of Nate Saint, Jim Elliot, et al., are told in both “Beyond the Gates of Splendor” and “End of the Spear,” which are available for free viewing on Hulu, the poor person’s Netflix! Thankfully my own family’s missionary experience, though trying, did not involve murderous villagers or loss of life. Of course I do not directly compare them, except to note that both stories show sometimes making “big” sacrifices or steps of obedience as a Christian can turn out in a way that makes you feel like you’re falling flat on your face if you don’t have a wider perspective to see beyond the moment. And by “beyond the moment,” I mean it might be well beyond your own lifetime that anything comes together, even. This is a hard thing to grasp hold of! Just some commentary on our appearance: We all had hurache sandals, but mine were multicolored because there were no more white ones in my size when we got them. I didn’t like not matching my sisters in our shoes, and I was really frustrated that I had outgrown the sweet acid wash denim outfit that Beth so fashionably models in this photo. But seriously… isn’t little Naomi the cutest thing you’ve ever seen? She was probably 3. And that poor cat is probably the most pathetic animal to ever walk the planet. I think I remember that we were not allowed to play with her. Experiencing significant life upheaval at a young age, like if your mom begins working outside of the home while you are all adapting to another culture, has a way of changing how a child sees the world. 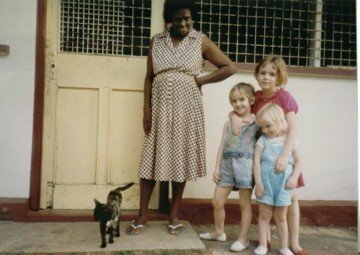 I was a precocious girl, very conscious of the culture shock we faced in both directions – moving to Trinidad and moving back to the States a few years later (the move back to the US was infinitely harder) – and I can’t remember much about life before this time. Plenty of my memories are of fun and carefree kids: playing outside in the rain (even the rainwater was warm! ); eating fresh mangoes; our first puppy “Scooby”; seeing parakeets perched in the trees and telling my mom “I didn’t know those actually lived anywhere for real… I thought they were from the pet section at Meijer!”; little lizards everywhere; and our special trip to the one McDonalds in the whole country where I got a Polly Pocket in my kids meal. But there were challenging aspects that I remember, too: We went down there with practically nothing – personal belongings like clothing, homeschool books, toys, etc., for our family of five fit into eight trunks, and yet the neighborhood kids thought we must be princesses because we each had a Barbie; We could barely understand the “English” spoken there; Some of the food served to us was really gross, like pigs foot soup, and yet we obeyed my mom’s “look” that said finish your plate and if you say anything I swear I will kill you on the way home; cockroaches the size of my nine-year-old hand and toads the size of a dinner plate; and on several occasions our small home was burglarized while we were sleeping. While I was old enough to know about some of the difficulty we all faced, this was an experience that has made my life richer and brighter, and I’m enjoying the memories these tastes and smells trigger for me. 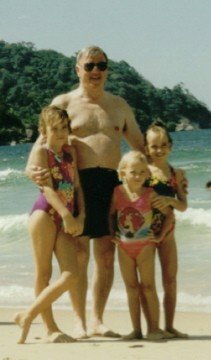 Grandparents visited us the second year - with Poppa at Maracas Bay. He played in the waves with us, and it was the first time I'd ever seen him without that toupee. For Thy Church which evermore, lifteth holy hands above. Off’ring up on ev’ry shore , her pure sacrifice of love. – For the Beauty of the Earth, Folliot Pierpoint 1864. Abby, I loved this post. What a world-changer for a 9-year-old girl. It’s so encouraging to see how God has used what was probably a fairly traumatic life change in your life and is still using it. I love you and I also loved this post. You, Naomi and I should just talk about Trinidad and our memories now that we’re older – I am sure we all remember different aspects of our lives there, and it would be fun to hear what you girls held onto. Mmmm…fried plantains! Breadfruit! Delicious! Thanks guys! The experience was definitely not a bad one, but there were plenty of really difficult things. I think the break-ins were the worst. I remember feeling so violated – and in retrospect I realize Dad must have been pretty terrified to know that bad guys had broken into our house while we were all sleeping there and managed to rifle through our stuff and take things. That’s pretty creepy. Yes, Beth, we should definitely have a slideshow night or something to relive whatever memories we have. And it could be real slides… I know Mom had old-fashioned slides made of at least some of the pics. Can you believe we have been back for fifteen years? I feel really old! You should post what you remember about it while you are home to get more photos scanned. I had to steal these pics from Mim’s facebook. I mostly miss the fruit! And “Bake and Shark” meals at the beach!